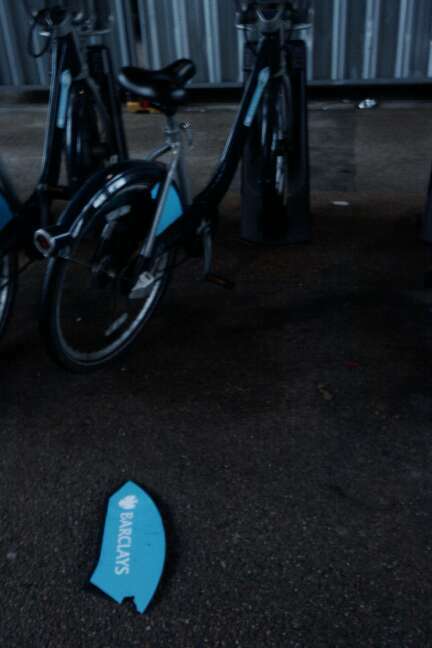 Way back in July, when the Barclays Cycle Hire scheme launched a couple of months late, we had a little play around with the bikes to get our first thoughts. Just a quick back-and-forth beside the BFI. The bikes were fun and sturdy, just right for their particular job. It was only later that we saw the credit card bill. Since then, the “vandal proof” Boris Bikes have had time to be hit by a few cars and kicked around after a few Christmas parties. More importantly, since then I have temporarily left London and become instead a once-or-twice-a-month visitor for business and social events — pretty much the target audience for the hire bikes. So I’ve been using them (or trying to) on the non-member “casual” basis on the five days I was in town these past couple of weeks. The first thing to note is that it’s very easy to use the non-member system, and once you’ve done it once, it becomes easier still. When I first hired one it took little more than sixty seconds (though of course I agreed to the EULAs without reading a word of them), and once you’ve got your one/five day access, it’s even simpler next time. At least, this was the case on the first day when I used them. On the second day, on the South Bank, something wasn’t right — all the machines were very slow to respond, the buttons needed a harsh jab before they would do anything, and after two minutes of waiting with the spinning circles, they gave an unhelpful error message. This has since happened on 40% of the days when I’ve tried to hire a bicycle on 24hr access (n=5). In each case I was in a hurry and had to quickly implement alternative plans, so didn’t bother calling customer services. If it happens again and I have the time to spare, I’ll see what happens and report back. The second is availability of bikes: on the first day, my snow-delayed coach from Scotland got in to Victoria at just after 9; on the second day my snow-slowed train from the Westcountry got into Waterloo at just after 9. In both cases the docking stations — including the massive one at Waterloo — were empty. But there were plenty in the nearest neighbouring stations, including those behind the festival hall and under Waterloo Bridge, where Serco were still redistributing bikes in the morning, despite the new “super” station at Waterloo which was supposed to end the need for redistribution to and from the South Bank. The reverse was true when making the return journey: the “super” station at Waterloo was full by seven o’clock, forcing one to ride around the South Bank seeking an alternative. Then run for your train. Running for trains brings me to the third observation to note: the docking station black-spots. 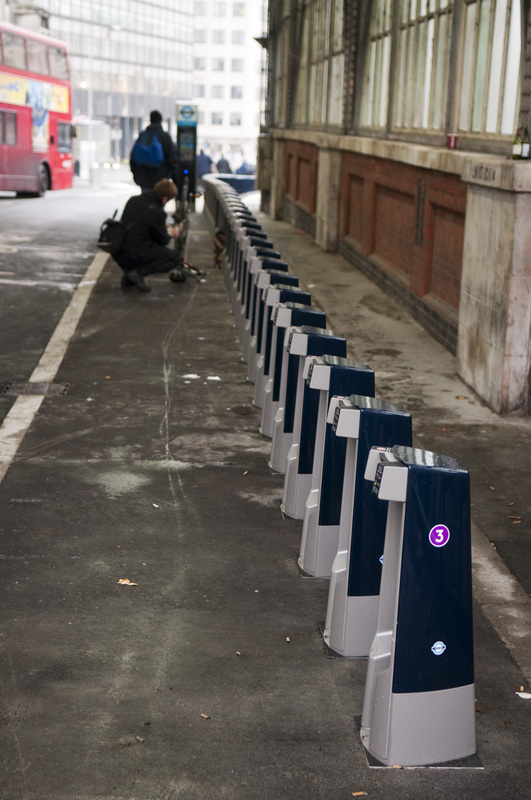 Due to objections from the boroughs, not all of the stations have yet been installed. Their absence was particularly noted in the Albemarle Street area when I left the pub 25 minutes before the last train, but proceeded to waste 10 minutes running around looking at Layar before I found a station. The Kenny Farthings themselves remain excellent, and far superior to my shoes in the snow. On one, the gears were noticeably slow and crunchy when changing, but, given my bad habit of leaving bicycles in top gear and using brute force, I didn’t have much opportunity to examine that. All this matches what those who responded to the London Assembly transport committee’s survey said: the bikes are great, but the scheme doesn’t make for a reliable transport option. Where buses are slow, tubes vulnerable to signal failures and suicides, and taxis likely to get caught in jams, a hardy bicycle should be the most reliable way to make a journey of a few miles through central London. But the hire bikes aren’t. Try to rely on them and one day you’ll turn up at an empty docking station or a terminal that spends five minutes loading an error message; no oyster card in your pocket or taxi pre-booked. If you do get a bicycle, have you planned in advance where you’re going to leave it at the end of the journey, and if your preferred destination dock were to be full, have you considered your backup plan and left enough time if you need to use it? I hope these are just the last few teething troubles, and not an indication that, like most British transport and built-environment projects, politicians are willing to invest in building something fancy and new and newsworthy, but not in its subsequent boring running costs, maintenance and bug fixes. According to the end-of-year TfL report, the hire bikes get a lot of custom from commuters, and some from business use. And the bikes would indeed be perfect for the sort of central London professional who currently takes taxis to meetings — if only journeys and journey times were consistent and reliable. Under the current (evolving) implementation, they’re of more use to tourists who have all the time in the world and nothing important to get to. This entry was posted in Uncategorized and tagged bike hire, cycling, waterloo. Bookmark the permalink. An interesting post, I haven’t had reason to use the Barclays Cycle Hire scheme yet (I tend to avoid visiting London if at all possible), but was thinking I might do it sometime. Now I am wondering if it is possible to use them without a smart phone, the scheme seems to have been badly designed and implemented. Why didn’t they follow best practice from other cycle hire schemes around the world? There is plenty of experience to draw from! I don’t want to put you off — so long as you know where the docking stations near your destination are, and so long as your appointment is not critical (or you have left 15 mins spare incase you need to take the bus instead), they’re great. I’m keeping an eye out for a second hand folder or something cheap and sturdy that I can safely leave for weeks at a station, though. Joe, the Compass Marine was often recommended on Cycle Chat as a budget folder – single speed, and a bit heavy, but usually thought to be ok for the £100 ish price.